BSNL has announced the extended facility for activation and deactivation of Postpaid data plans under GSM Mobile services. 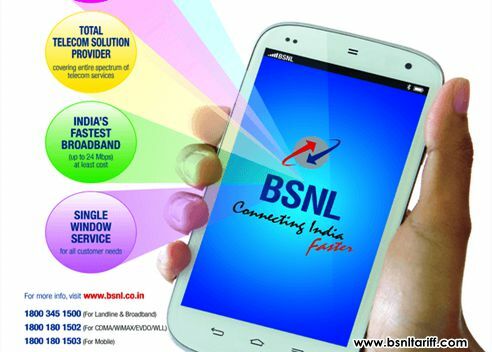 State run Telecom Company Bharat Sanchar Nigam Limited (BSNL) allows its Postpaid mobile customers for activation and deactivation of Data plans through SMS based services in all Telecom Circles. Earlier this procedure was added to Prepaid plans mobile service customers now BSNL has extended this facility to Postpaid plans mobile service customers for activation/deactivation of data services and subscription to the data packs etc via SMS using USSD code i.e Toll Free number 1925. If customer not received any specific request for a data plan the services will be activated and charging will be done as per the base tariff plan. However, customer submit any request to the above Data plans e.g. START DATA240 then the Add-on Data plan will be provisioned and reply SMS will be sent to the customer. The usage will be rated on pro-rata basis as per the plan of the particular month. Whereas, customers are now allowed to convert from existing Add-on Data plan who are already subscribed. If customer requests/sends multiple Add-On data plan then the same will be discarded by BSNL under this procedure. Customer to get further data service beyond their free data limit to the existing Add-On data plan can send SMS as CONTINUE to 1925 and get 60% discount on the excess data usage i.e excess data beyond the free usage will be charged @0.40ps/10Kb only instead of 1ps/10Kb. (Around 1GB will be charged @Rs.400/- exclusive of ST). Under the above procedure BSNL Service mobile numbers, Blackberry customers and CUG customers are exempted. Good post! Great blog to read and useful information about the technical which could be useful for the mobile users.